The TP-61 features a rotary type distributor which is independently ground driven for consistent flow of fertilizer. Quick removal of the planters (2 bolts) leaves this fertilizer attachment in place for side dressing crops as they are cultivated. 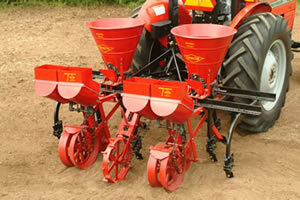 Planters handle seeds gently using inclined plates at speeds up to 6 mph (with Seedmaster Duplex Grain Attachment). 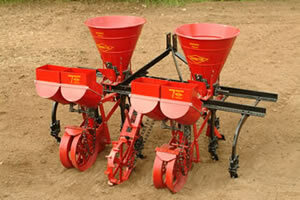 The TP-61 Planter is easy to set up and operate. It beds, plants and fertilizes in one operation placing seeds between two fertilizer streams so they are not damaged from contact with fertilizer.